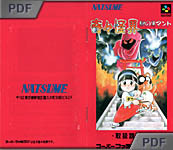 Kiki KaiKai Nazo No Kuro Manto is an top-down action game by Natsume. This totally new (and exclusive) episode of the series is a colorful overview action game featuring a cute and young little Japanese maiden called Sayo. Creatures all over the country are under a spell and have now become evil and it is her duty to find out what is going on and to destroy the source of this dark magic. She can use Shinto magic and her main weapons are a set of powerful throwing prayer cards and a duster magic wand. 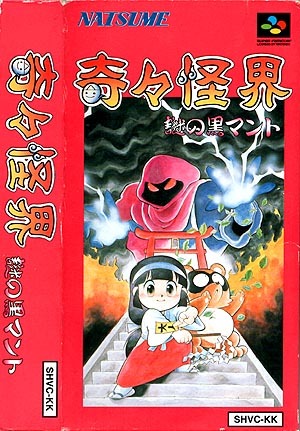 Like in the arcade version, she is accompanied by a raccoon who becomes here a second playable character. He can throw leaves instead of prayer cards and swipe monsters with his tail. Special attack moves have now also be added to the mix - when holding the fire button, Sayo can unleash a spinning swipe and the raccoon can turn into an indestructible statue for a short amount of time. They both start the game with a limited amount of energy-hearts but more can be gained along the way when stages are completed. Weapons can also be upgraded by collecting special items that some enemies drop in battle, they include blue orb (power-up the main weapon), red orb (fireballs), bombs and so forth. Some friend spirits are even hidden inside some elements of the scenery and freeying them awards the players with special items and other goodies. Pocky was enjoying a quiet cup of tea in her shrine, when Rocky the Raccoon, a Nopino goblin came running to Pocky. "Something terrible has happened. My fellow Nopino goblins have lost their minds. When I woke up, they were very agitated. When I tried to calm them, they came after me." "why"? "I don't know, but I believe that they are under the spell of another force... In any case, I can not handle this by myself. I need your help." Who on earth has cast the spell and are controlling the Nopino goblins ? And what for ? Find out as Pocky and Rocky battle the Goblins in this epic adventure from Natsume. Kiki KaiKai Nazo No Kuro Manto is such a nice and delightful game. I was a bit disappointed by the PC Engine version, and this Super Famicom episode just shines in every sense of the word. 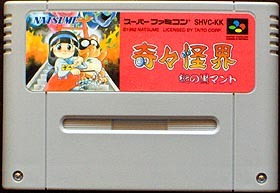 It is also a completely different game, only the opening stage would look familiar to anyone familiar with the Kiki KaiKai series. Controls are fast and the gameplay is well balanced and really addictive. Shame that the excellent Japanese art work was changed (again!) for the American Super Nintendo release and replaced by an ugly (to my taste) illustration. All in all, Kiki KaiKai Nazo No Kuro Manto is a delightful platform game, full of surprises and fun. A great title that no fan should miss.